Writing is a funny thing. Sometimes, the words flow right out of me, and whatever I’m working on seems to write itself. Other times, I have to labor over it, take breaks, and try not to pull my hair out. As you may already know, I am working on finishing my first novel. It’s been a long, long process because I started the book when I was 13 or 14 years old (I was home schooled, people). It was a short story at first, and then it turned into a novel. I’ve been working on it for forever. I put the book away for a couple of years, and pulled it out again about a year and a half ago. So much had changed in me, that the work I’d done seemed weak and watered-down. Luckily, I happened upon an editor who helped me tremendously. Since then, I’ve been rebuilding the story. It’s the most difficult thing I’ve ever done. Apparently, most writers do their best work when they edit. They struggle to get something on paper, and then work with it again and again until it turns into something beautiful. This is not how I write. My best work comes in the rough draft. I am extremely creative, and when an idea takes me, I can pound out quite a bit at once. When I edit, I look for errors, overall smoothness, consistency in the character/story line, and making sure nothing is unnecessary. I usually don’t need to do a lot of restructuring. Which is lucky, because I do not derive great pleasure from editing my own work. Editing isn’t a flow for me. It’s like walking down a street and looking for litter to pick up. For as long as I can remember, I’ve wanted to be a writer. It’s always been my dream. Even at a very young age, I was writing my own stories. Through the years, I’ve learned how much of a process writing is. For one thing, writing is something that is internally processed and then externally displayed. This means that events and circumstances in my life that are emotionally stirring will change the way I write. I’ve also found that if I’m reading an author with a very strong writing style, I tend to emulate the author accidentally when I write later – which means I’m grounded from reading when I’m writing. 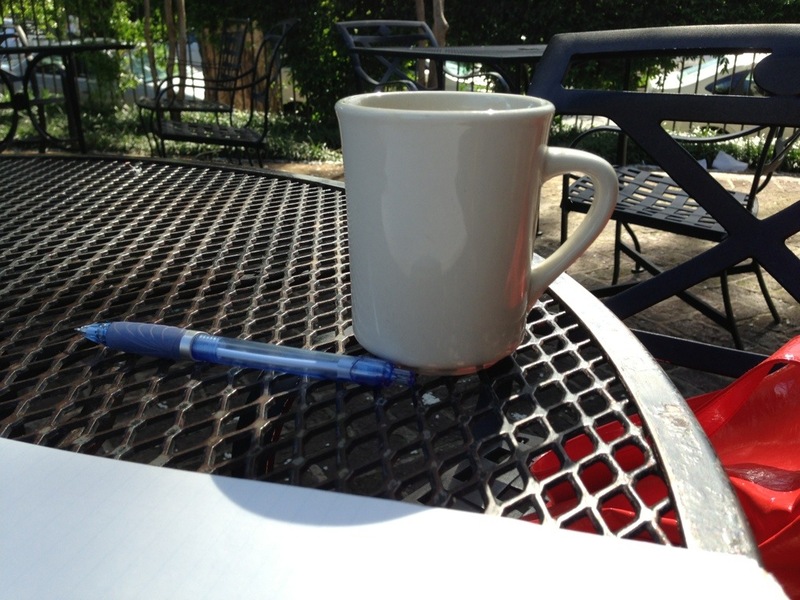 When writing, you’ll probably find that you write better in certain environments. For instance, I have trouble writing in the living room because there’s a TV in there, begging me to watch just one episode of Scrubs. However, writing in the kitchen is less of a problem. I’ve found that, for me, leaving the house is actually best. Sitting in a library or a coffee shop to write seems to rein in my focus, because I’m not thinking about the laundry I’m running or the floors that need to be swept (again). Writing a paper or a blog post is vastly different from writing a novel. When I’m writing a blog post, I can knock that sucker out in less than an hour. I just need my blog notebook, a pencil, and a semi-quiet spot to work. When I’m working on my book, I need a big chunk of time. I need to be able to linger. I usually need coffee. I need to open my binder and folders, and to spread out my papers with character’s biographies, descriptions, and timelines of their lives. I need to set myself a goal before I dive in. I need to immerse myself in the world I’ve created. You’ve probably heard this before, but it’s very true: read your work aloud. You’ll notice that your voice falls into a sort of rhythm. Sentences that tangle you when you’re reading them aloud should be gone over again. Some activities help us write better. For me, having two writing projects going on at the same time – my blog and my book – helps increase creativity in both projects. I’ve also found that spending time outdoors, and engaging in other creative activities helps. Cooking creatively, crocheting, or completing a craft keep my mind active and sharp. Exercise can also help – even just taking a short walk outside. Certain activities will help you write, and some, you’ll find, will kill your creativity. If you’re writing for an assignment, then you’re already accountable. If you’re trying to write for yourself, however, it’s important to find someone you can talk to about your work. They can help encourage you, and knowing that someone is expecting something of you will help you finish the job.